Caenorhabditis elegans is one of the most widely used model organisms in biomedical research. A major problem with current imaging techniques is phototoxicity that leads to the observation of perturbed dynamics and finding new label-free, high resolution imaging it is of crucial importance to better understand the anatomy and physiology of this precious organism. Here, we present label-free imaging of live Caenorhabditis elegans with the 3D Cell Explorer. The 3D Cell Explorer overcomes the problematic mentioned above as it injects in the sample ~100 times less energy (~0.2 nW/µm2) than light sheet microscopes (~1nW/µm2) that are the reference in the matter. With a resolution below 200 nm, it enables high resolution and high frequency imaging of live C. elegans. A special thank you goes to Friedrich Preusser and Nikita Vladimirov from Max Delbrück Center for Molecular Medicine in Berlin who allowed us to use these images. On this video we can visualize the holotomographic label-free 3D scan of different phases of the early development of C.elegans: A. Unfertilized oocyte in the uterus (green arrow on the right) and Spermatheca (green arrow on the left); B. Fertilized oocyte with clear impermeable egg shell (green arrow); C. Embryonic stage AB: the septum between the two cells is marked with a green arrow; D. Embryonic stage AB2: the embryo is composed by 4 cells. The egg shell is nicely visible and indicated by a green arrow; E. Embryonic stage ABn: the embryo is composed by numerous (n) cells. In the field of view is also visible the mouth of the mother as indicated by a green arrow; F. In the uterus of this worm two different embryos are developing at different pace: AB2 on the bottom and ABn on the top. 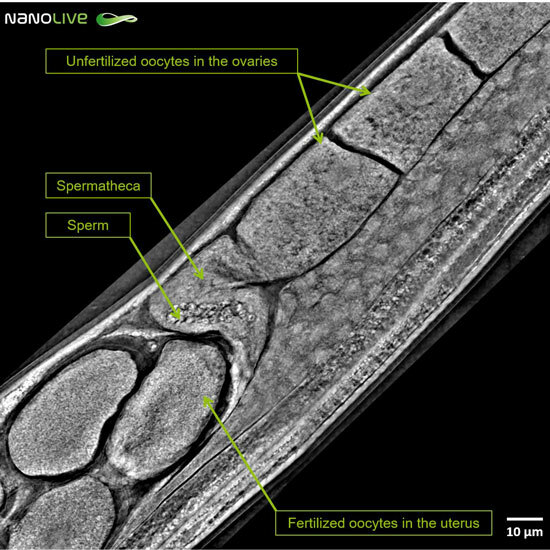 This image shows unfertilized oocytes that wait in the ovaries and one by one transit to the uterus through the spermatheca where they meet the sperm and are fertilized.